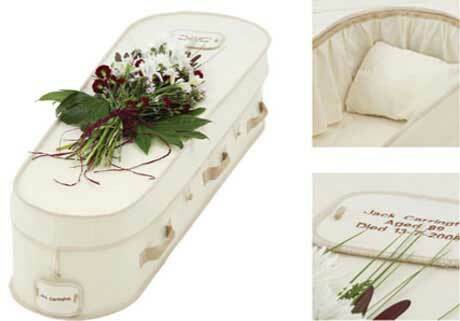 The Natural Legacy Range by Hainsworth woollen coffins are a range of environmentally friendly woollen coffins and caskets that offer a comforting and soft alternative to the traditional wood coffin. The Swaledale coffin is made in Yorkshire using pure new wool, supported on a strong recycled cardboard frame. The interior is generously lined with organic cotton and attractively edged with jute and has a waterproof base which is biodegradable. Available in Natural (White) or Russet (Brown). standards. 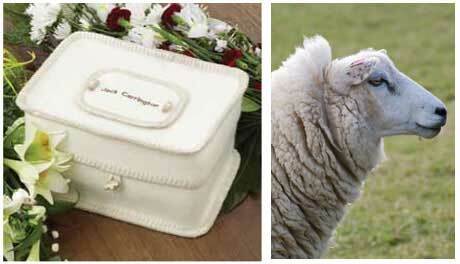 the woollen casket is personalised with an embroidered name plate.